No question, the best weekly planner is the Freedom Mastery Deluxe Law of Attraction Life Planner. Find your passion, delegate responsibilities, and reach your peak potential using the Freedom Mastery Deluxe. With a design based on leading scientific studies, no other planner can boast these kinds of results. 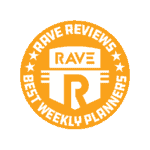 If you’re anything like us here at RAVE, your whole life exists in your planner. It’s like your own brain bound into a book on the desk in front of you. Our planners keep us on track and operating at peak performance. The best planners are like a life coach, a guide, a mentor, and a friend. But everyone has a different organizational style. Do you like to have your day managed down to the minute? 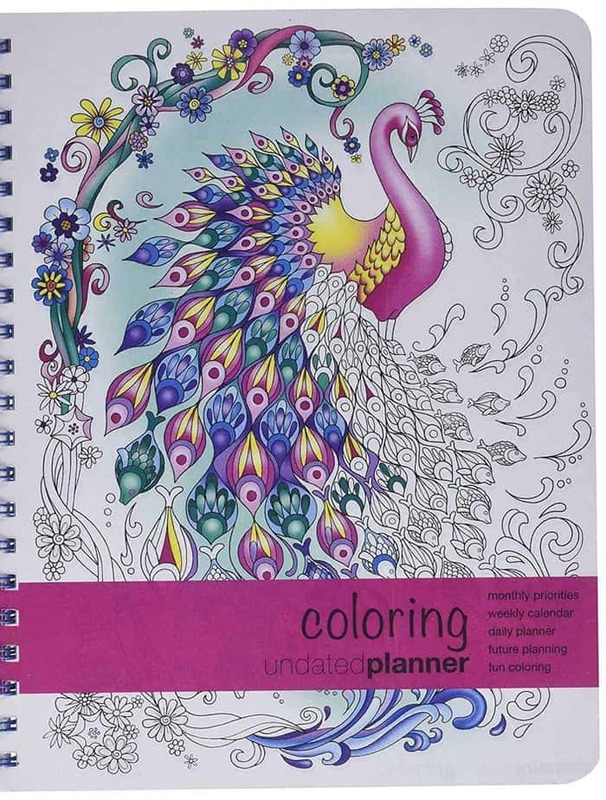 Or are you more free-spirited, needing a planner that lets you dream as well as stay organized? 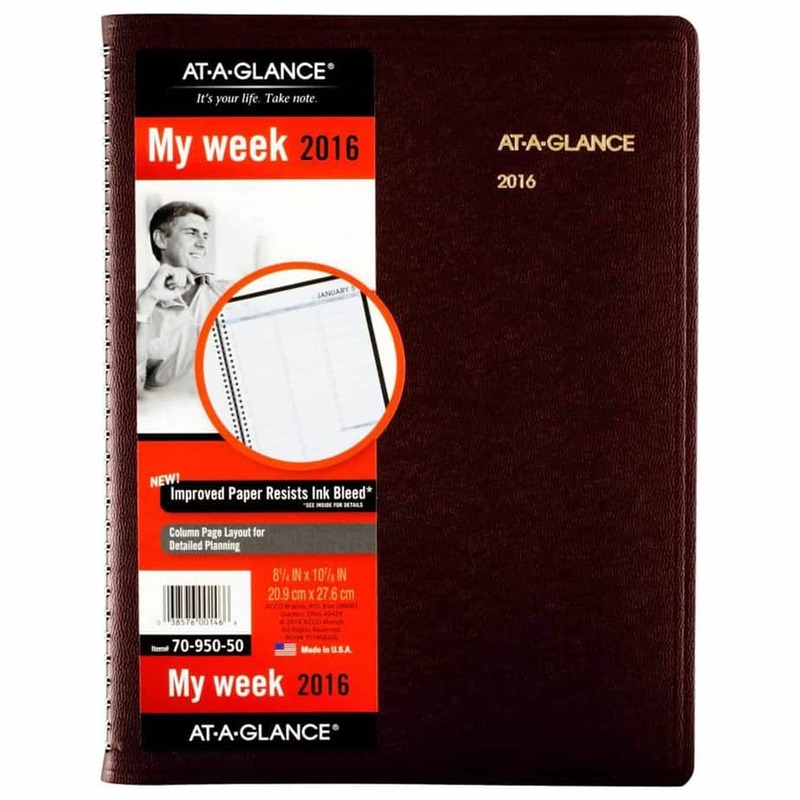 To help, RAVE Reviews presents the very best weekly planners on the market. Read on and find the perfect weekly planner for you and your lifestyle. There are 7 days in a week, and "someday" isn't one of them. Go after your goals with one of these weekly planners. Whether in business or in your personal life, the Freedom Deluxe will help you achieve your goals and realize your dreams. With weekly to-do lists, feel good lists and gratitude lists, the Freedom Deluxe keeps you on target while encouraging important work/life balance. The 13-month format makes the At-a-Glance perfect for teachers and students planning along the calendar year time frame. And weekly 2 page spreads feature lined daily columns with appointment times that provide 15-minute scheduling intervals. Get more done on the job with the DayMinder, offering 12 month planning potential, January-December. It allows you to plan your week within one column per day in 15-minute intervals. As the year draws to a close, take the time to look back at the past year’s accomplishments. It’s all there in your planner. You should feel proud of everything you got done, as well as the time you spent with friends and family. But a new year approaches. The work — and the fun — will start all over again. And no matter how many digital planner options are out there, there’s nothing like writing it down by hand. 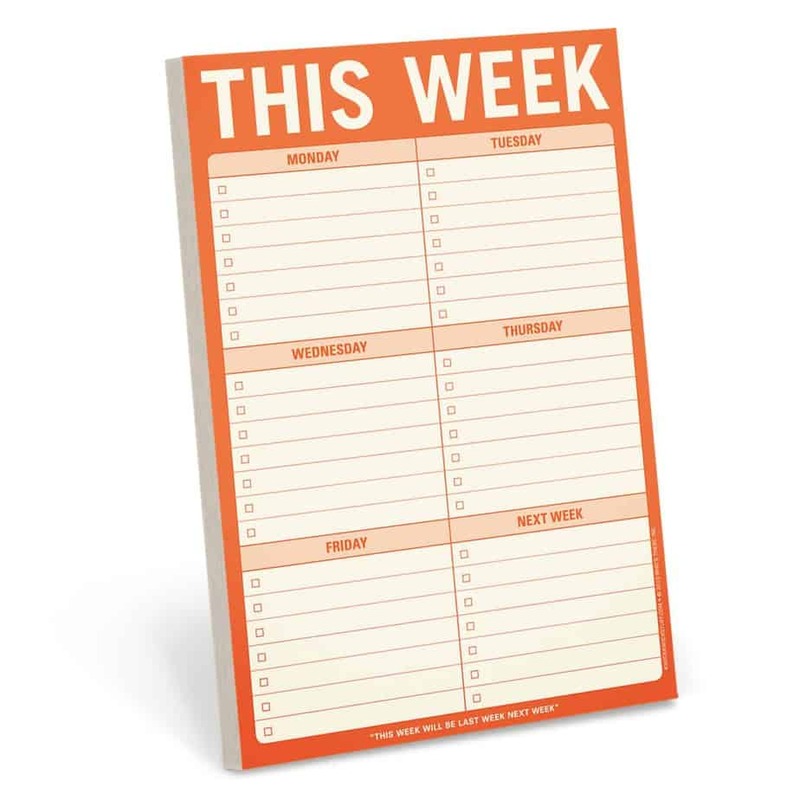 To help you choose the best weekly planner, here are a few pointers. With the right planner, this year could be even better than the last. Do you like the way the planner looks? Does it keep you motivated? Do you like things colorful and busy, with a variety of calendar layouts as well as optional planning tools? Do you prefer something minimal, to get your thoughts and ideas down quickly and cleanly? 2) Even the best planner can’t do your work for you. Let’s be real: a planner can’t do it all for you. Once you buy a planner, you’re going to have to use it. What good is writing it down and never looking at it again? An effective relationship with a weekly planner needs to be monogamous. Whether it’s work or play, writing your life down multiple times in multiple locations makes it twice as likely you’ll end up in a real mess. You bought it. Now check it! It’s called a weekly planner. But you need to check it daily. Take it with you, and keep it visible at all times. Write it down or you’ll forget it. Get in the habit: If it’s important, write it down. That goes for work, family, or free-time activities. There’s nothing worse than double-booking yourself due to a preventable planner fail. Make time to review the day ahead. Whether it’s the night before or the morning of, make some time to check your planner to get your day started right. This is the best way to keep you focused and ensure that you aren’t forgetting anything important. Just because you wrote it down doesn’t mean it’s humanly possible to accomplish it all. Don’t over-schedule yourself. Be realistic. And once a task is complete, check it off and celebrate. 3) Try it. You might like it. A quality planner can be a bit of an investment. Some companies offer printable pages on their website so you can do a trial run before you commit. Determine your budget, and don’t be afraid to try a few out in advance. And once you find a planner you like, it will make next year’s decision even easier. 4) What kind of size and layout do you want? Do you plan your day down to the hour? Do you simply need a space to keep track of appointments? How portable will your planner need to be? 5) What kind of binding do you prefer? Choosing the right binding can make a big difference. Spiral bound planners will lay flat on a desktop, while discbound systems allow for adding pages or moving things around. Know your binding preference before you buy. 6) Don’t forget the extras. Different planners come with different features. Do you need help setting goals or establishing a budget? Picking the right extra features will keep the relationship with your planner happy and productive. Our research team analyzes a wide variety of customer reviews to come up with our rankings. This allows us to determine which products really stand up as the best you can buy, based on the experiences of thousands of customers who have put these items to the test. Is the planner dated or undated? So read on. 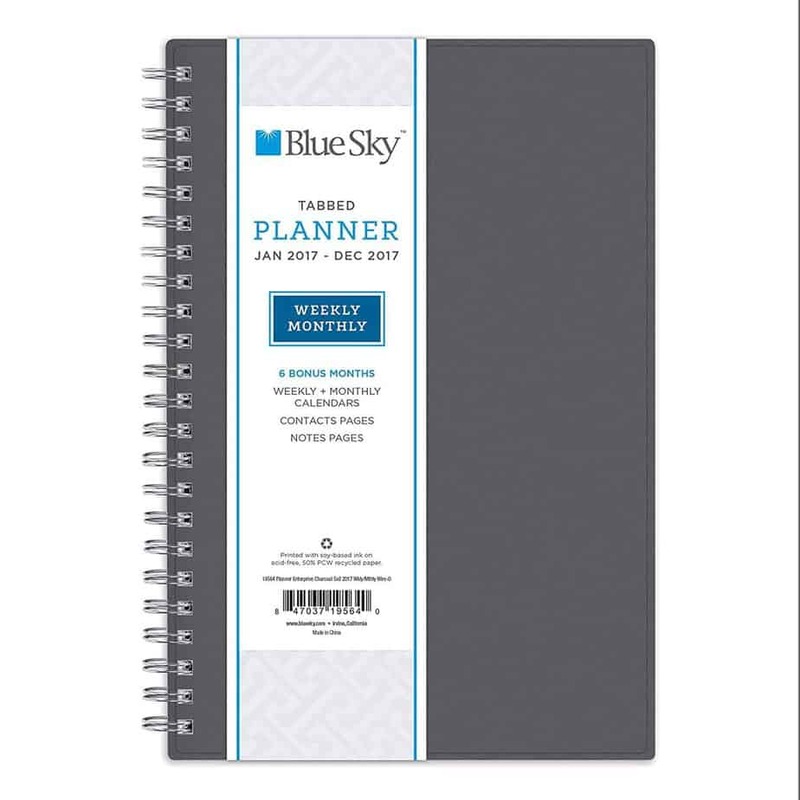 It’s never too soon to pick a planner that’s right for you. With over 200,000 users world-wide, the Freedom Mastery Deluxe is a life planner and business planner all in one. The planner helps you set goals for all parts of your life: business, health, love, finance, personal, and spiritual. The planner’s design is based on science, proven to increase your productivity and happiness. There’s a specially designed positive habit creator to help you stay on track. And because it’s not all about business, you’ll find weekly to do lists as well as feel good and gratitude lists. In addition, the feel good guide and energy vibration table will help put yourself first — to focus on feeling good most of your day. 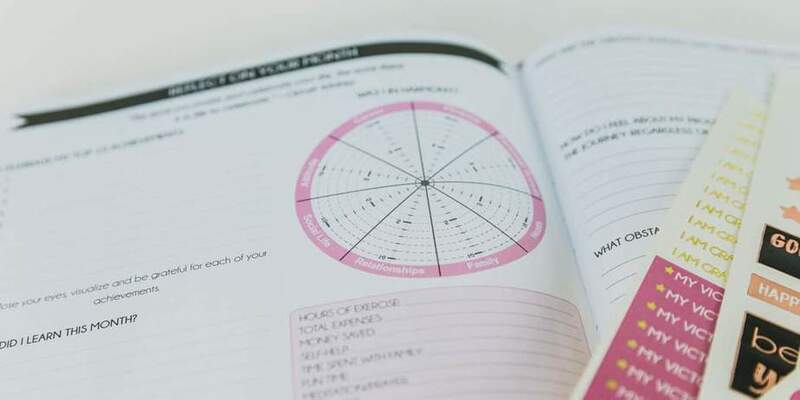 The planner also includes an awareness and self-discovery guide, an annual goal setting guide, and even a guide to craft your vision and mission statement. Slim and stylish, this planner has thick, premium quality paper and Mylar-coated tabbed dividers. 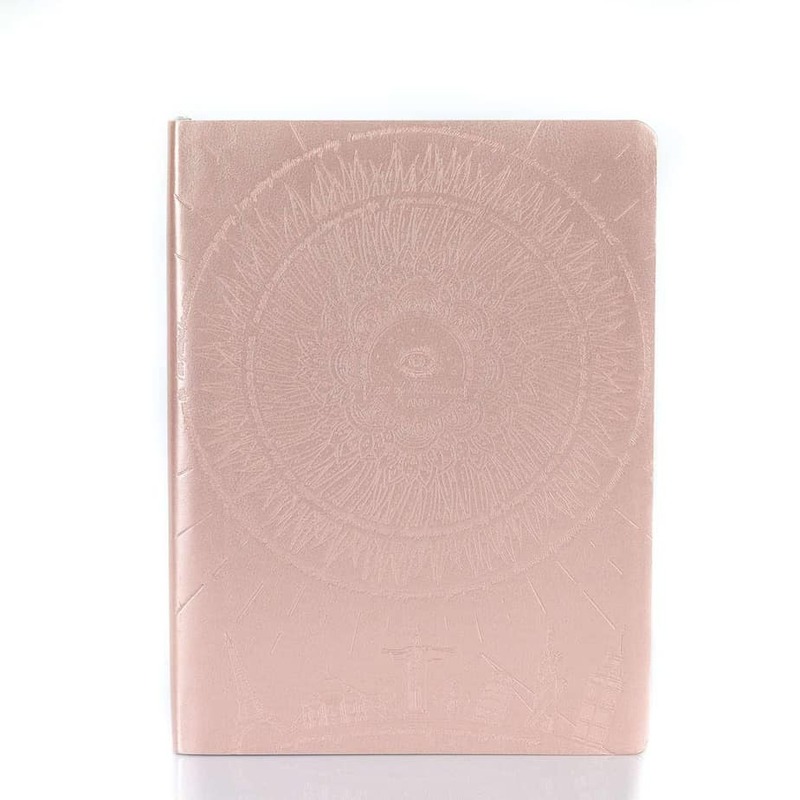 The cover is durable, and the planner is printed on 50% post-consumer waste recycled paper. The planner features 12 months of monthly and weekly pages for easy year-round planning. There’s also full monthly view pages for each month, with separate pages for full weekly view. There’s also a previous and next month reference calendar on monthly view pages for long term planning. Major holidays are even listed with elapsed and remaining days noted. Product size is 8.5 x 0.4 x 11 inches. This planner is perfect for business professionals, college students, teachers, or anyone with appointments to keep. This weekly appointment book covers 13 months. This is perfect for teachers, administrators, parents, and other professionals who are used to planning along the calendar year time frame. And one week spans a 2-page spread with one column per day. There are Julian dates, as well as quarter-hourly appointment times, to plan your day in 15 minute intervals 7:00 AM to 8:45 PM, Monday – Friday. To keep things in balance, quarter-hourly times run 7:00 AM – 5:30 PM on Saturdays. This keeps your evenings free. And Sundays are condensed and untimed. The planner is printed on on quality paper containing 30% post-consumer waste recycled material. And the wire-bound weekly planner features a simulated leather cover for a professional look. Page size is 8.25 x 10.88 inches, and overall size is 8.88 x 11.38 inches x 9/16 inches. 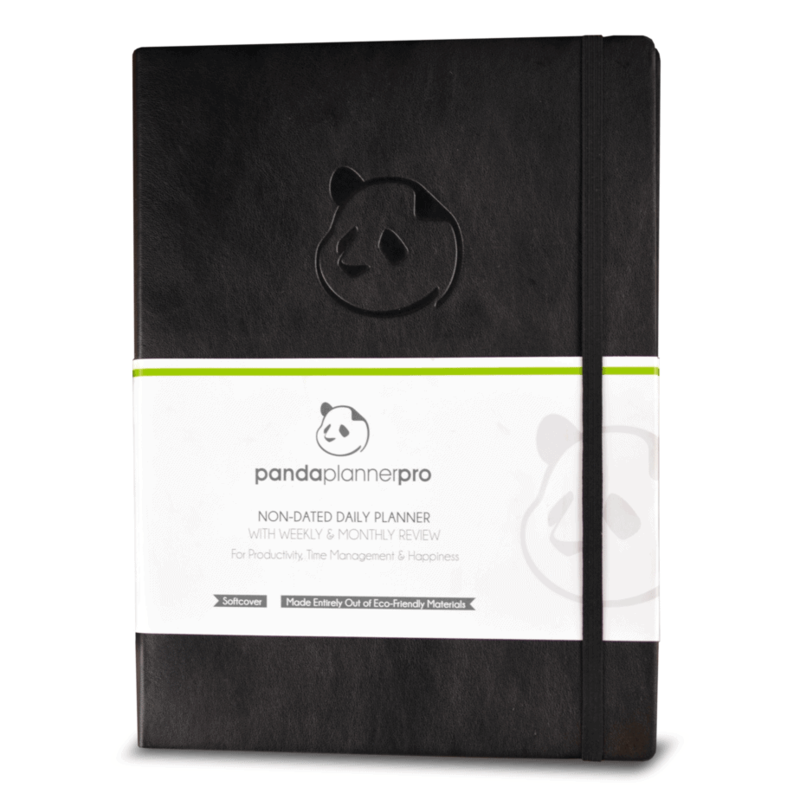 Get more done weekly with the Panda Planner and its scientific approach to productivity and happiness. With a faux-leather cover, and 8 ½ x 11-inch dimensions, the Panda Planner has a new weekly format, allowing you to plan 7 days, from Sunday to Saturday. And it’s all in one 2-day page spread. Labels with a green stripe are the Panda Planner Pro versions (daily) and the labels with a red stripe are the Panda Planner Weekly (no daily pages). With January to December monthly, weekly, and daily sections, as well 88 pages for notes and bonus 16 months planner stickers, anyone can stay organized with this product. With a durable, soft faux-leather cover, the Lemome Planner is environmentally friendly. In addition, the planner uses thick, acid-free, archival-quality paper that is both kind to the Earth while protecting your eyes from strain due to the all-natural materials. Don’t miss the expandable inner pocket for add convenience. And there’s also a handy pocket to stash business card, small items, or planner stickers. Product dimensions are 5.75 inch x 8.25 inch. This purpose-driven pad helps you organize your daily affairs without losing sight of the big picture. It’s said the Knock Knock pad is perfect for the organized and disorganized alike. 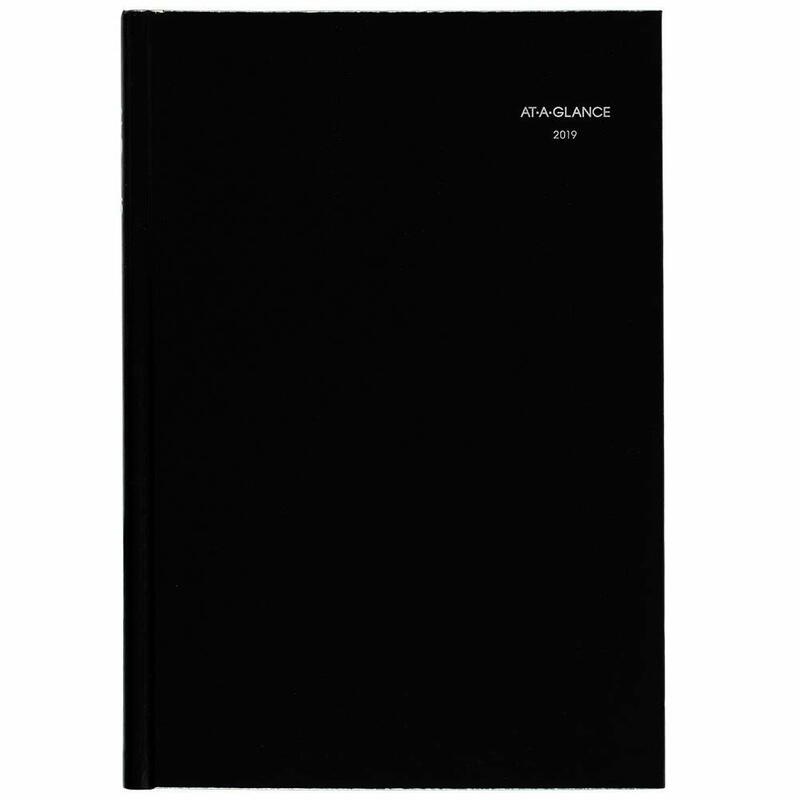 It’s 6 x 9 inch with 60 sheets, and the layout provides ample space for filling up to 7 lines under each day of the week. Give it as a gift or use it as a planner for the whole family by setting it up in a central and highly visible place for all to see. “This planner includes everything I want,” says another satisfied customer. For a creative outlet (or to pass the time in a long meeting) the Action even lets you color imaginative images of flora and fauna. 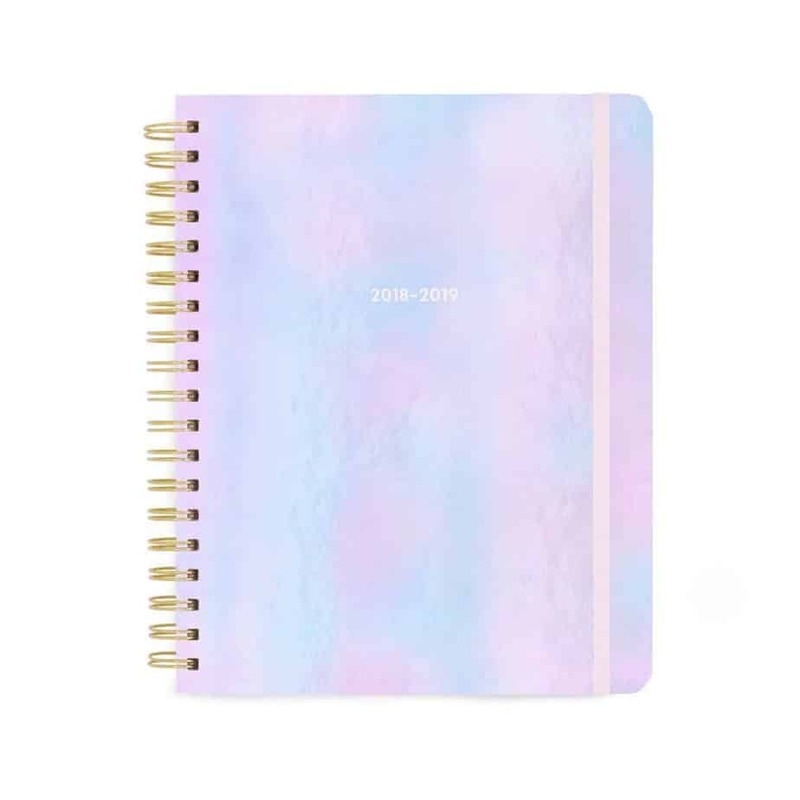 This is the planner for anyone who needs a little beauty with them at all times. 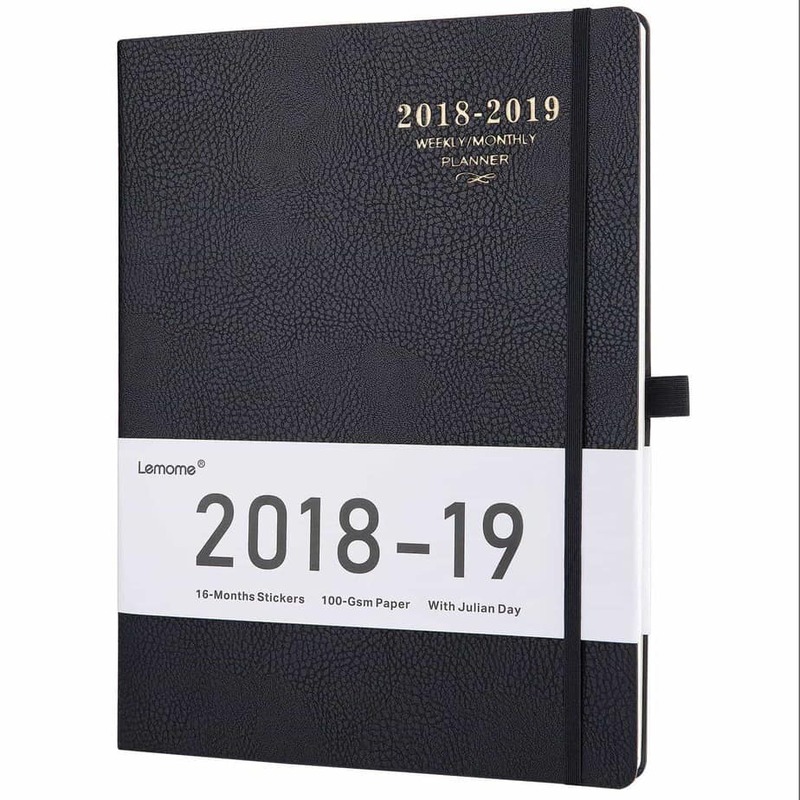 The planner is sturdy, with a 100% recycled chipboard back, firm yet flexible clear covers, and a WIRE-O double loop binding. And Action emphasizes the importance of improving yourself and your relationships with their I-US-ALL philosophy. 90 lb. durable card stock resists bleed-through, ensuring your schedule and art stay clear and legible. Product dimensions are 11 x 9 x 0.5 inches. The DayMinder is for those constantly on the go. 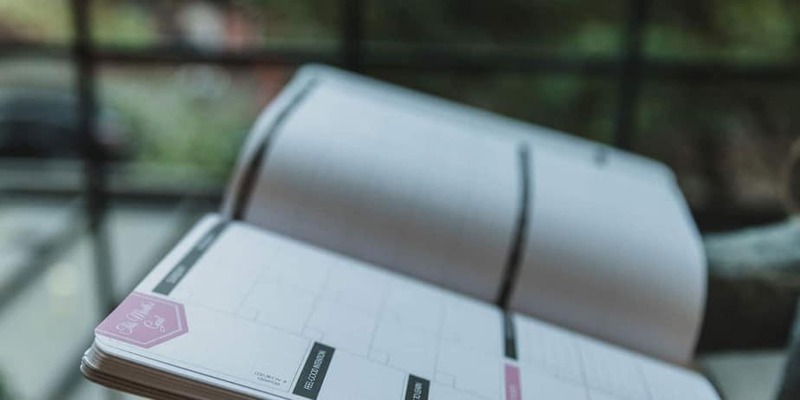 It unlocks 14 months of planning potential, January-December, allowing you to plan your week within one column per day in 15-minute intervals. The pages are 8 inches x 11 3/4 inches, with one week per 2-page spread. Perfect to fit in a bag or under your arm. You’ll also find quarterly-hour appointments after 7 AM – 9:45 PM during the work week, as well as 7 AM – 6:45 PM on Saturdays. In addition, you can take advantage of past, current, and 2 future months reference. And it’s all printed on quality paper containing 30% post-consumer waste, topped off with a black simulated leather cover. Perfect for those who love a good to-do list, the uniquely shaped Iconic Weekly planner is designed for wrist comfort and accessibility. Each notebook has 60 sheets of paper, one for each week. And there are 12 different paper designs. The strong, twin-ring binding of the notebook holds the paper together, also allowing the planner to open up completely. This all allows for full utilization of the space provided. This charmingly designed, 13-month daily planner has a hardcover and measures 10 inches long x 8 inches wide. It’s spiral bound with an elastic band closure. There’s a double-sided pocket page and laminated color-coded month tabs. New editions even include a “virtual reality” page, as well as a coloring page, and 3 new sticker pages. Use the front pocket page to stash everything from receipts to business cards and more. There’s also 2 empty pages before the start of each month, perfect for jotting down extra notes or ideas. Fans of the Bando call it “perfect in every way,” and “the best agenda I own. The quality is fantastic.” To stay motivated, the planner comes with an inspirational “The Future is Now” poster. Hang it in your home or office and get more done with the Bando. Here are some common questions and concerns for first-time weekly planner buyers. These answers will help ensure that your weekly planner purchase is the start of a beautiful relationship. Why should I use a planner? We’ve all been there: that sinking feeling when you realize you’ve missed a meeting or special event. Diligently using a weekly planner helps you be where you need to be when you need to be there. If that’s not enough, here are some more reasons to start using a weekly planner. Keep all of your to-do lists in one place: No more writing on the back of receipts and crumpled-up sticky notes. Focus on what’s important: Learn to get done what needs to get done and save the rest for later. Increase your productivity: Map out a plan of attack in advance and get more done. Checking off your to-do list is satisfying: Watch those tasks get checked off and then go enjoy some well-earned time off. What’s the best way to use a weekly planner? 1. Weekly planners are just that: tools to help you plan your week. Use them as such and you’ll stay ahead of the game. Ask yourself: Is it something that can be accomplished in a 7-day period or something that must get done on a specific day of the week? Plan accordingly. 2. Checking your planner daily helps you stay on track in all areas of your life. Use it to manage your work-related to-do list, and to remember when it’s time to take a break for a birthday party or dinner with friends and family. You can even use your planner to get a jump-start on prepping meals, scheduling workouts, or deciding on an outfit in advance. Keep your planner visible, write down what you need to know, and know what you can accomplish. Be realistic about how much you can really get done in one day or even in one week. Pick a time every day to update your planner and stick to it. Plan out weeks in advance, or take it day by day — just find a pattern that works for you. 4. Don’t overdo it — downtime is important. 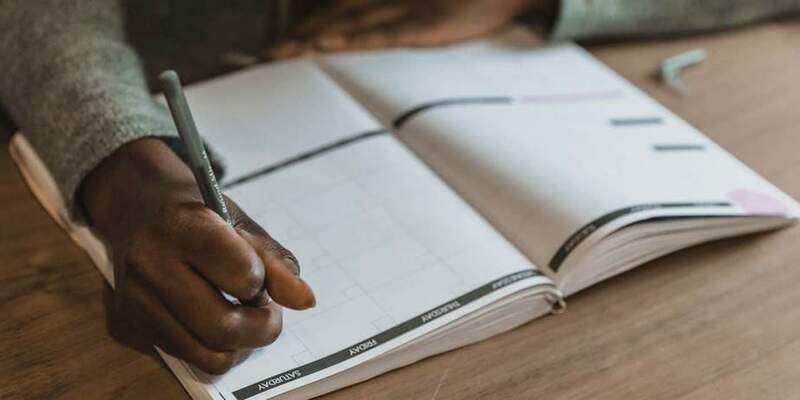 To really incorporate your planner into your routine, remember that it’s not designed simply to help you stay busy, but to help you be happier. Use it to spend your time more wisely, and you’ll see the positive effects in every part of your life. What are the best weekly planners? Stylish Planners: Planners come in all kinds of designs. The more you like looking at your planner, the more likely you are to use it on a daily basis. Planners for Teachers: Teachers need all the help they can get keeping their busy lives in order. 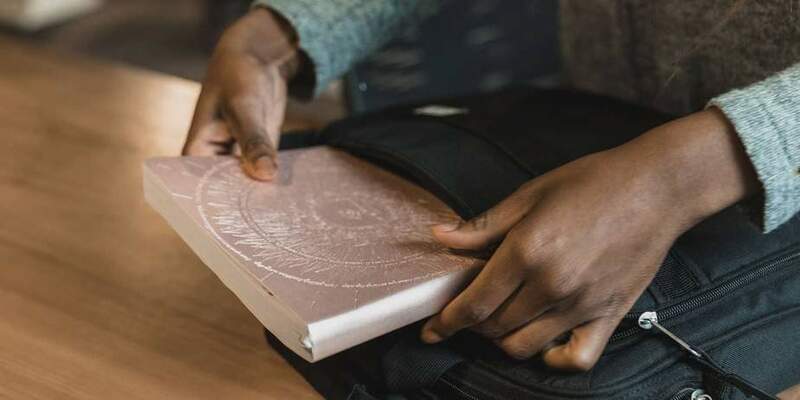 Planners for Students: Getting through school is a lot of work, and these planners have what it takes to help you succeed at all levels of education. Planners for Goals: Are you looking to get more out of life? These planners can help. Planners for Your Desk: Keep your home and work life in order with these convenient desktop planners. Planners for Professionals: These planners have what you need to succeed on the job. Make your planner even more effective with these must-have planner accessories. Pilot Frixon Erasable Gel Pens: Keep your planner neat and tidy with the Pilot Frixon Erasable Gel Pens. These super pigmented, colorful pens easily erase in case of any mistakes or change of plans. Levenger Circa 1-2-3 Portable Hole Punch: This portable hole punch gives you the freedom to add paper to your planner. It’s compact and flat, perfect to carry along with you. Me & My Big Ideas Accessory Pouch: Keep pens and other small accessories right at your fingertips at all times with this zippered accessory pouch. Use the elastic band to keep the pouch securely attached to your planner. Life Planner Stickers Set: Life Planner Stickers open endless possibility when decorating your planner to fit your own personal style. Polaroid Mobile Printer: Print any pic from your phone wirelessly in seconds. Keep memories in your planner and make your planning as personal as possible.